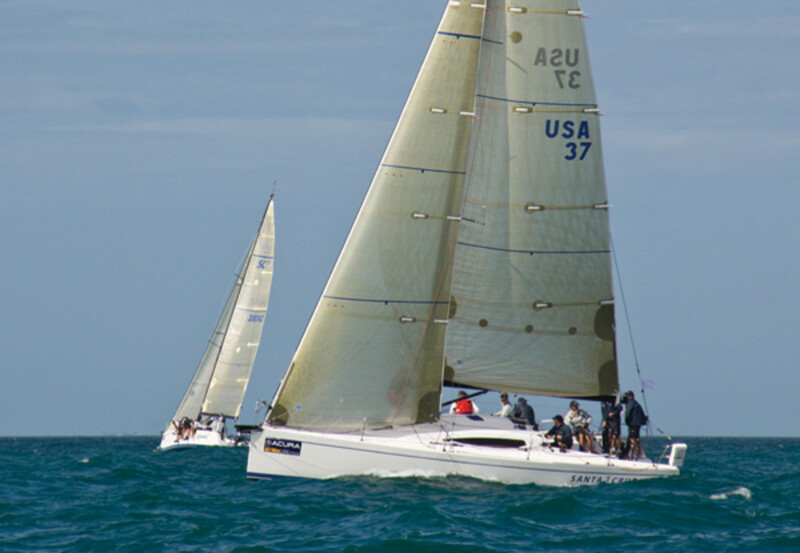 The Santa Cruz 37 was one of several new high-performance keelboats introduced at the 2008 Annapolis Boat Show. However, describing the SC37 as a “keelboat” isn’t really accurate. This is a 37-foot lightweight carbon raceboat with horsepower to burn. Its high aspect-ratio torpedo bulb keel provides plenty of stiffness by getting the lead bulb 7 feet, 6 inches below the waterline; it also fully retracts with a powerful winch or optional hydraulic ram. The bulb comes up nearly flush with the hull to ease trailering and even make launching from a ramp possible (instead of having to line up for the crane). Here’s my take-away from a test drive that took place in a building breeze at the mouth of the Severn River, off Annapolis, Maryland. Both the hull and deck are built with carbon-fiber fabrics, epoxy resin, and a structural PVC foam core, over a layer of isophthalic gelcoat in the mold. Hardware mounting points and high-load areas on the deck are reinforced with high-density-foam inserts and biaxial and unidirectional carbon fiber. The structural grid is made of E-glass with carbon-fiber reinforcements and is bonded to the hull with methacrylate adhesive. 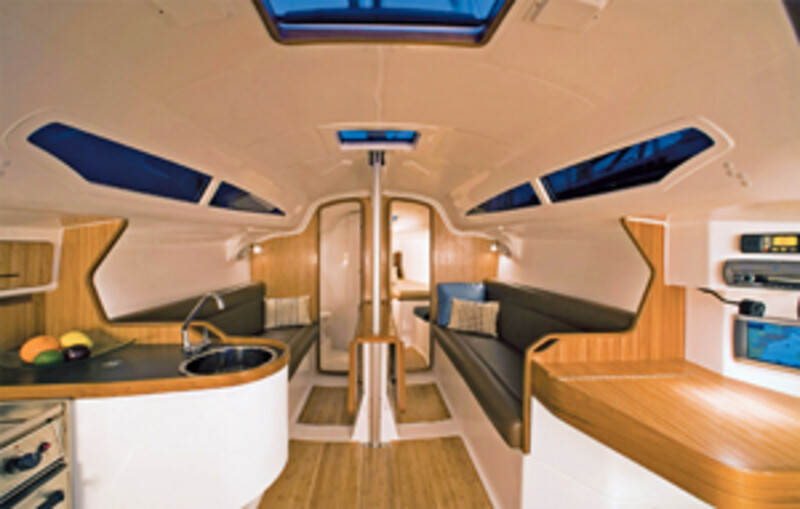 The main structural bulkhead is made of carbon with a PVC foam core and is bonded to both the hull and the deck. This boat was the darling of the shows because it just “showed” so well. 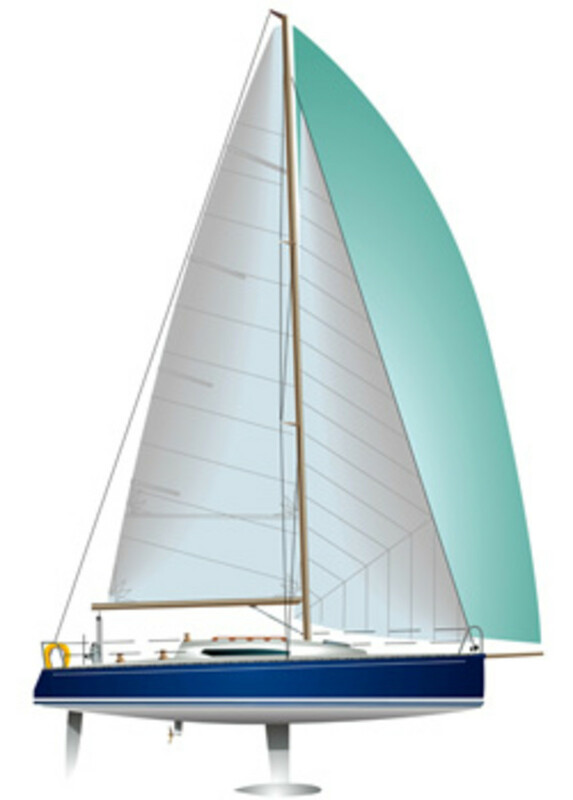 From the easily retractable daggerboard-like rudder (set in a cassette) to the twin carbon helms, open transom, and dual “sprits” on the bow (a short, fixed prod for the Code-0 and a long, retractable carbon pole for a big A-sail), the SC37 had lots of clever, though not really revolutionary, features. As we threaded the needle through a throng of powerboats lining up for the powerboat show, the go-fast deck layout did not surprise or disappoint. Long, easily accessible traveler with plenty of purchase on the sole directly in front of the helms—check. Double-ended mainsheet—check. Adjustable jib cars and dedicated jib in-hauler system led aft—check. Harken 40 two-speed primary winches—check. The cockpit has plenty of elbow room for a racing crew, and the lack of backrests makes it that much easier to maneuver crew weight up on the rail. Well-placed chocks by the helms allow for a comfortable driving position as the boat heels. Visibility is excellent. You’re probably not going for a boat like this based on the accommodation plan, but it’s surprisingly spacious, comfortable, and, dare I say, even a bit “shippy” as opposed to “hard-core-racer-y.” Wood veneers give the space a warm glow, the long fixed cabinhouse windows let in plenty of light, and it has all the features (comfortable bunks, 6-foot, 3-inch headroom, big galley and nav station) you’ll need to spend a bunch of days aboard. And of course the saloon table folds up to reveal the top of the lifting keel. The breeze steadily built from a glassy 10 knots to a spirited 18 as the wind funneled out the Severn. Perfect. Early on, during the light-wind portion of the test, tacking angles were narrow (approximately 75 degrees), helm feel was balanced and responsive, and we sliced to windward at an easy 7 knots. You don’t need to be a flashy, sunglasses-wearing pro racer to keep speeds in the 7s and the boat in the groove. Sweet. As the wind ratcheted up, so did acceleration. Wind speed and boatspeed were almost in direct correlation. That said, as the big A-sail went up, the wind built to the high teens, boatspeed jumped to the high 9s and 10s, and the helm and sail trim required a bit more focus. That is the case on any high-performance boat; everything was under control, but the wide groove narrowed a bit. We ran out of water quickly at those speeds, and after several laps down the drag strip, we doused the kite and headed for home. It was at that point, working upwind in about 18 knots of breeze, that the helm felt a bit “funky” under the load. It wasn’t overpowered, but it felt kind of bound up. A crewmember was working the traveler in the puffs, and the boat’s designer, Tim Kernan, was on board, so when we got back to the dock I asked Tim, “Have you noticed anything with the steering?” He responded, “This is hull #1, and we thankfully got it to the show, but our supplier sent the wrong bearings for the barrel cassette. We’re all over it, and that funkiness will disappear with the new bearings.” These things happen, and I have no doubt that the steering will be spot-on in the future. Headroom: 6&apos;3", berths (forward/aft) 6&apos;x5*8" (at widest point), 6&apos;7"x5&apos;8", Saloon seats 6&apos;3"x1&apos;8", Cockpit seats 4&apos;x1&apos;6"
We didn’t really need the engine to get off the mooring, but the 29-horse Yanmar (smartly placed in the lowest part of the center of the boat) provided all the oomph we needed to get boatspeed up to 6 knots. Handling under power was exactly what you’d want and expect. 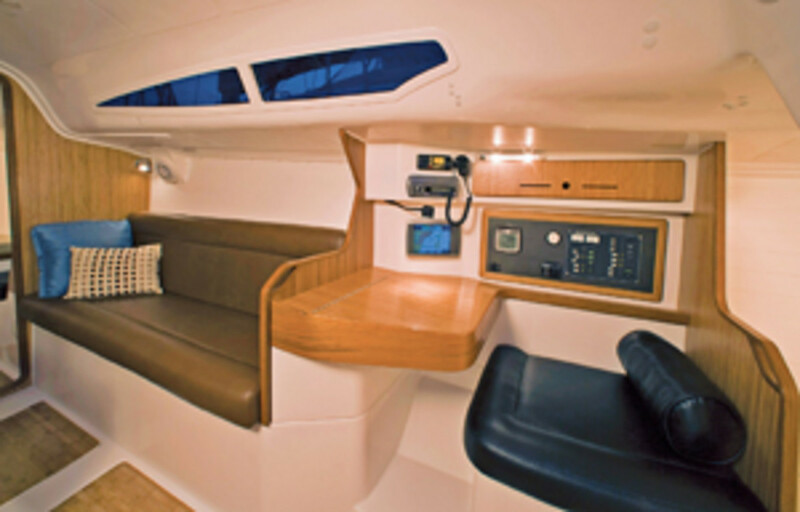 This is a light, stiff boat that’ll scream if you want it to, and would be quite comfortable on a cruise or living aboard during regattas. The lifting keel will be a boon to anyone who has dealt with bigger keelboats on trailers or to those of us who sometimes try to cut corners over a shoal and fail. I’m not all that concerned with the steering issue I encountered. This is part of a new boat’s teething process. As long as they get that cassette/rudder setup dialed in, this boat should have a place at the table.